Opening April 1 for the 2017 season! Pre-season hours: 8 a.m.-8 p.m. | Seasonal hours: 7 a.m.-9 p.m. Try this Hatteras restaurant with Great Food ~ Awesome Service! Delicious, freshly-prepared food – you really can’t beat “the ACC” for breakfast, lunch or dinner on Hatteras Island, NC. Atlantic Coast Cafe's atmosphere is casual but our food is seriously delicious. Come by in the morning for our terrific Hatteras Island breakfasts - the aroma of fresh coffee and biscuits greets you at the door. Enjoy your favorites from our full menu of omelettes, breakfast plates, egg and cheese biscuits and bagels, really amazing pancakes, french toast . . . you get the picture! Breakfast is served until 11 am (and most of the breakfast sandwiches can be ordered all day). But breakfast isn’t our only passion. Check us out for lunch and dinner! Enjoy our complete Atlantic Coast Cafe menu of fresh seafood (we are a member of Outer Banks Catch), our unique reubens and wraps, our fantastically popular grilled fish tacos and tuna wraps, a huge selection of sandwiches, an awesome special menu of mac ‘n cheese and fries, some satisfying salads, our flavorful shrimp ‘n grits and dinner entrees made fresh daily (posted on the specials board). Refreshing smoothies, fresh coffee or chai tea, dynamite desserts, really amazing freshly baked muffins, and cafe latte/mocha freezes are available all day. 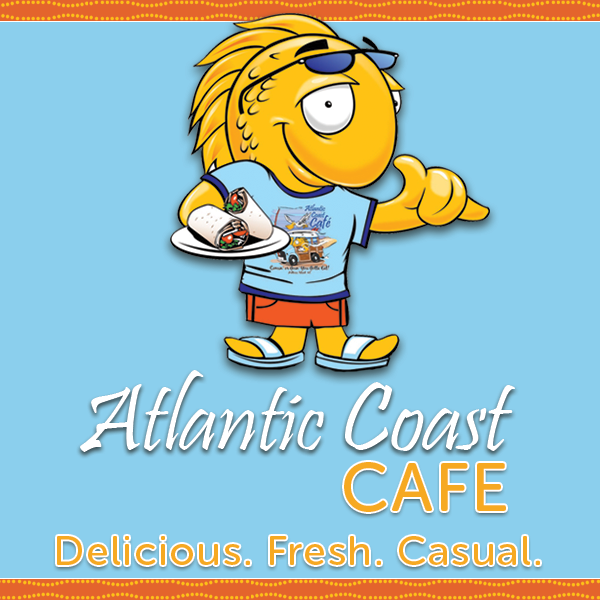 The Atlantic Coast Cafe Waves complete menu is posted on our website so check us out! While you’re here, you’ll want to check out the many customer reviews posted on the “Customer Comments” tab. You will also find reviews on Yelp and other online sites. LIKE US on FACEBOOK for special coupons and to join the conversation about good food and events on Hatteras Island. Visit us in WAVES in Hatteras - just across Hwy 12 from the KOA. We look forward to serving your Hatteras restaurant needs! Comfortable casual beach atmosphere; family friendly; free wifi; indoor and deck seating. We feature great service, clean and comfortable surroundings, indoor and outdoor seating and a popular menu of well prepared food! Also - free WiFi, a kids menu, breakfast sandwiches available all day, and pretty much the full menu is available for take out. We do a great job packing you up to go! © Atlantic Coast Café Hatteras Island 2019. All rights reserved.